ALLIGATOR RECORDS, June 20, 2018 — Living Blues magazine has announced the nominees for the 2018 Living Blues Readers’ Awards. Eight Alligator Records artists received a total of 12 nominations. Rick Estrin & The Nightcats received three, Elvin Bishop and Shemekia Copeland each received two, and Coco Montoya, Tommy Castro, Marcia Ball, Lil’ Ed & The Blues Imperials and Oscar Wilson (of The Cash Box Kings) each received one. 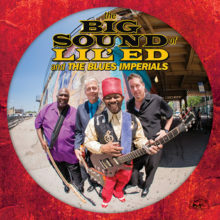 Lil’ Ed & The Blues Imperials are nominated in the Best Live Performer category. The public –subscribers and non-subscribers alike– can vote at www.livingblues.com or by mailing in the ballot in the current issue of the magazine (#255), by July 15, 2018.